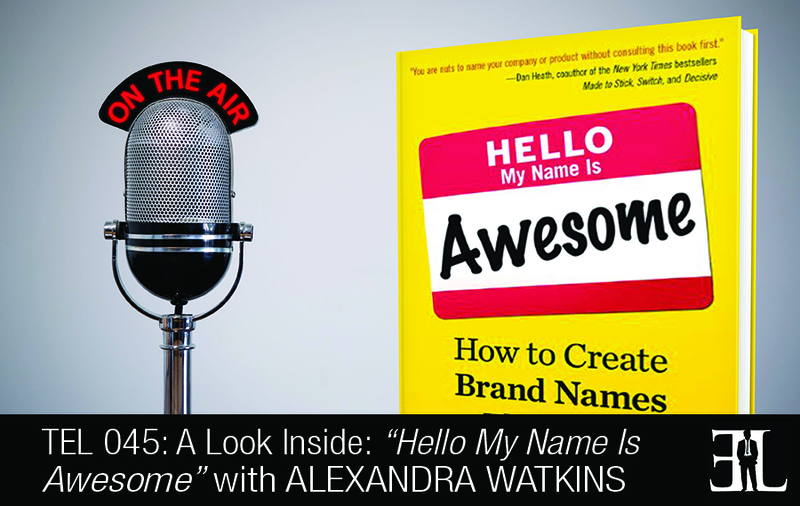 In this episode Alexandra Watkins shares her book Hello My Name is Awesome where she teaches you how to create brand names that stick. In her book, Watkins delivers the real insights into naming a business and clever ways to create a slogan so entrepreneurs can learn the proper techniques for branding business. This book is perfect for the entrepreneur or small business owner who does not have the budget to hire the services of a branding agency, but has the will power to learn how to do it themselves. There are no other books on naming. There are plenty of books on branding but these books were written in the 70’s and the rules have changed. The reason no one has ever written a book on naming is because namers are traditionally linguist and you cannot teach linguistics in a skinny little book. I don’t use linguistics in my naming, I just teach people how to name things using concepts and being clever. Entrepreneurs will probably want to jump straight to chapter three on domain names but I would say to start from the beginning because the book is written in sequential order. Anytime you have to explain how to spell or pronounce your name or what it means, you’re essentially apologizing for it and that devalues your brand. Before you jump into creating names you really need to understand what makes a name good and what makes a name bad. The book starts off with a chapter called Smile. Smile is an acronym for the five qualities that make a name great. S stands for suggestive and you want to have a name that suggests something about your product. The M in smile stands for meaningful. You want your name to be meaningful to your customers, not just to you. The L in Smile stands for imagery. People remember pictures and images much more easily than they remember words or letters. The E in Smile is very important. You want your name to make an emotional connection with people. 50% of purchasing decisions are based on emotion. Think of a time you purchased a bottle of wine that you’ve never tasted before but you liked the label, that’s an emotional purchase. The next chapter is called Scratch – The Seven Deadly Sins and when to scratch it off the list. If your name looks like a typo scratch it off the list. If your name gets flagged as misspelled when you type it into a word document, it’s a problematic name and will drive people crazy. Make sure to be original and come up with your own new idea for a name. After that we jump into the domain chapter. The #1 misconception in naming something is thinking you must own the domain name. Many big companies have started out not owning their domain name and it doesn’t matter. In the book I give you 30 different words you can put before or behind your name. As your company grows you can think about purchasing your domain name but until then don’t obsess over it because it really won’t matter. In chapter four you are given a roadmap to follow and a lot of questions to answer about the goals for your name, everything from brand positioning to your target audience and your brand personality. In this chapter I give examples so you can see what I am talking about. The internet is your best source for brainstorming and I give you all kinds of website to go to. Lastly, I give you some ideas on how to review names. It’s easy to come up with the name sometimes but it’s hard to get everybody to agree and this chapter will show you how to build consensus. I have 12 rules for building consensus and have developed these over the years by having to do it constantly with our clients and they really work. I also talk a little bit about focus groups and why you shouldn’t use them. I am a self-taught person who didn’t go to college. When I was in eighth grade I knew I wanted to be in advertising and I was able to talk my way into an internship with an ad agency. I eventually landed at Ogilvy and Mather. I talked my way into becoming a namer at Lander while on a Match.com date. I am an interesting person and traveled to more than 45 countries including Libya, Zimbabwe and Cuba. I did not want to write a book, my parents are authors and I know that writing a book is a lot of work for not always a lot of money. I got an e-mail from a publishing company asking if I had ever thought about writing a book. I didn’t jump on it right away. I struggled with if I wanted to take all that time writing a book. I deliberated about three weeks over it until I finally decided to do it and I am so glad I did! About 90% of people who contact my company can’t afford us and I thought the book would be something that they could get and help them on their own. Here is the resource I used to come up with the name VoterSnap﻿: http://www.SquadHelp.com – It was inexpensive and extremely valuable. On the 5 day contest, I offered an award of $111.00. I received 1600 entries from 121 different people. This books concepts combined with that diverse brainstorming team will make for an amazing combo for any naming endeavor.